Anyone around here have one?? I'm gonna order one for the SBH BisHunter. He custom makes them for your gun. I emailed pics to Von and will mail him a tracing of my gun and payment tomorrow. I talked to a guy here at a gunshow a couple weeks ago who said it;s the best holster he's ever had and it took him 20 years to find it. He says that with the wrap around design it's form fitting and doesn't flop around. Very easy to get on a off when taking off your coat, etc. Not a bunch of straps to fool with. Here's a pic Von emailed of one with what looks like a redhawk. Notice the buttons on the strap. You could tighten it up and raise it higher. I think this pic gives the illusion that it is larger than it really is. Here's another pic from Ringlers website. And a couple from Dustin Linebaugh's site for sixguns without a scope. It looks like this one's been carried some. I have a similar rig from Pistol Packaging called the Bandito. What I like is the ease of changing holsters for each gun. Have you seen the Bandito? Ya, I looked at pics of the Pistol Packaging rigs and they looked like the holster would flop around. Maybe I'm wrong? Anyway, I just mailed off a check and a tracing of my gun to Von Ringler to make my rig. I'll be the forum guinea pig on this one and let you all know what I think when it shows up. He said 3-4 weeks turn around time. I figure add another week or two for mail time, etc. I should have it by mid April. 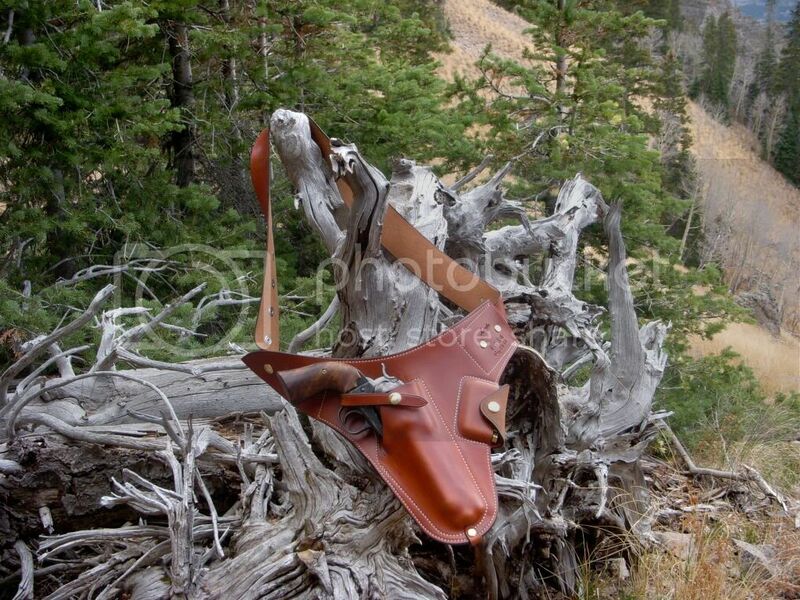 Yes I like my combo holster, I generally prefer a right hip holster for 99% of the time in the back country. 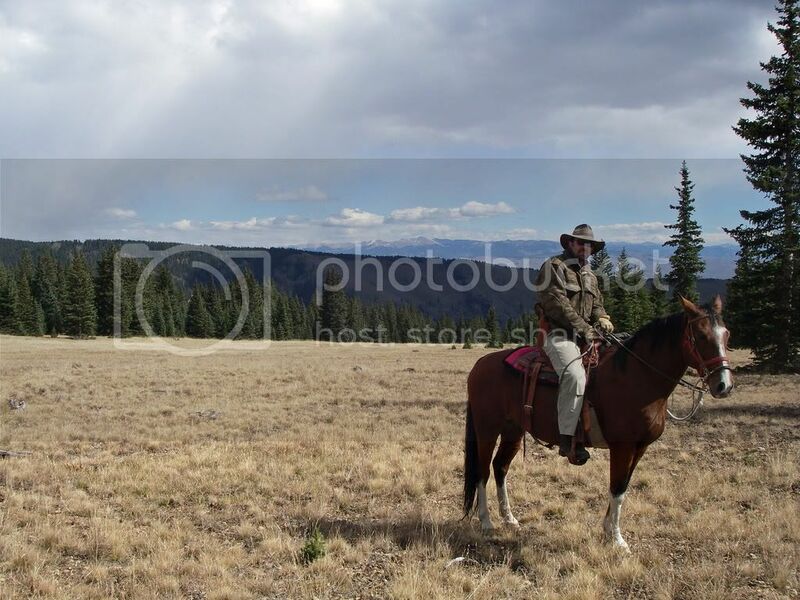 But for hunting in the back country it is nice as you can keep it under a jacket really easily. Also works very well while carrying a gun fishing with waders on. My favorite holster I own in a pancake style holster with a thumb break. It is holds the revolver high on my hip while controlling the weight of the gun so I don't even notice it on my hip. It is a 98% solution for me. Regrettably I don't appear to have ever taken a picture of the holster up close. This is the only picture I have of the holster at all, I like the picture but it does not help much here. I can see by your dress that you are a cowboy. Generated in 0.033 seconds in which 0.002 seconds were spent on a total of 15 queries. Zlib compression enabled.